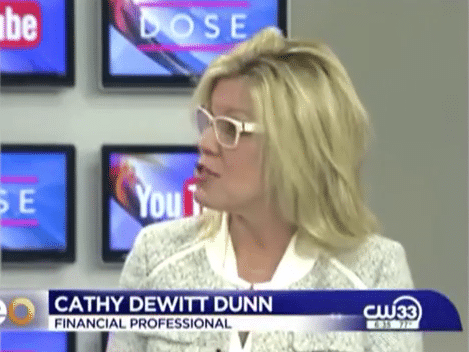 Cathy DeWitt Dunn joins Eye Opener TV’s hosts Laila Muhammad and Oliver Tull to discuss job costs and some possible ways to save money on those costs. Laila Muhammad: You know how much a pay check is worth, but did you ever stop to think about how much your job is costing you? Well, studies show it costs about $3,000 each year to go to work. So joining us this morning is financial professional Cathy DeWitt Dunn to tell us how we can bring those costs down. I never thought about that, $3,000 just to go to work? Cathy DeWitt Dunn: That’s a lot of money, isn’t it? Laila Muhammad: I need my refund on some of this stuff. So what are the things that factor into that $3,000? What are we spending our money on to go to work? Cathy DeWitt Dunn: You know, it’s pretty interesting that 10% of all workers now report that they’re spending over $1,000 a month just alone in child care, according to Career Builder. That’s a big issue. Laila Muhammad: That’s expensive, $1,000 a month in child care. Oliver Tull: You know, you never really think about all the little things that add up to you getting to the point where you can actually accomplish your work. So, are any of those things, like, deductions? Maybe I can get some of that money back? Cathy DeWitt Dunn: That’s a great question, and the answer is yes. So if you’re paying for child care, you may qualify for a tax deduction. And you might also think about changing your hours or asking your employer if you could work from home. Because just those little things that you can eliminate one or two days a week of day care, that really is gonna be kind of a debt reliever. Laila Muhammad: Yeah, even thinking about things like gas, right? Just driving our cars to get to work. Cathy DeWitt Dunn: On the average, a person’s spending over $25 a week just going to and from work. But there’s some great ways that you can save money. Laila Muhammad: Yeah, let’s talk about the discounts on insurance. What is that about? Cathy DeWitt Dunn: You know, it’s pretty interesting just recently, if you don’t have a ticket, to be clear on that, you may be able to sign up to get defensive driving through your insurance company and they’ll automatically give you a discount. Now, this is the new rage and all the insurance companies are now moving to an app that you can download on your phone. It’s actually recording your driving habits. So you don’t even have to report what you’re doing or how your driving is. It’s free money, so why not? Laila Muhammad: Yeah, I’ve done one of those defensive driving courses. That was as a result of a ticket. You can do those online, too. Cathy DeWitt Dunn: But you know what, you can do it even if you don’t have a ticket. So just call your insurance company. If it’s free money and it’s sitting there, that’s just one way to reduce your expenses. Laila Muhammad: Any final thoughts for folks at home who want to save money heading to work? Cathy DeWitt Dunn: If you’re gonna go to work, one of the big items is clothing. You always want to look great when you go to work, but one of the things I always tell all of my clients: avoid clothes that you have that say “dry clean.” Dry clean only. There are so many great fabrics now available. Your clothes are gonna last longer. So just little tidbits like that will add up and help you in the long run. Laila Muhammad: Well, Cathy DeWitt Dunn, we appreciate you coming in and helping us save our money. We love saving money.